No of Channel 8 separate channel with individual adjustment of delay and gain control. Display LCD Display 16 x 2 Alphanumeric for indication of parameter value. 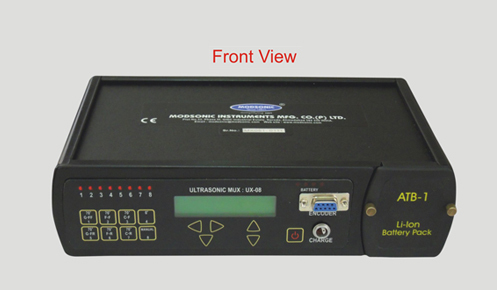 Gain Adjustment from -10dB to 30dB in step of 1db increment for each channel. 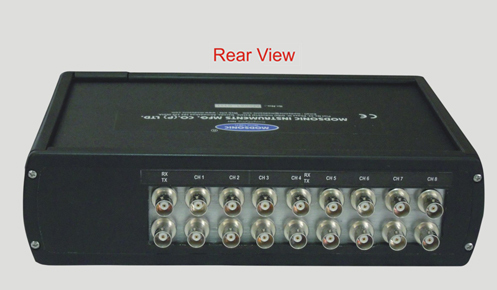 Delay Adjustment from 0 to 99mm in step of 1mm increment for each channel. Memory 10 calibration set-up can be store/recall. Operating Mode Factory set T+R / T-R internally selected. Channel Status Indication 8 LED’s for indication of on/off status of channel. Keyboard Sealed membrane keyboard with direct access key for channel selection. Battery Li-Ion battery pack 14.4VDC, 4Ah, gives 8 hours continuous operation from fully charged battery. Full charging is done within 4.5 hours. Operating temperature 0 to 55 C.
Dimensions 152 x 255 x 70(HxWxD).